Asian travellers are leading the field when it comes to mobile travel bookings and searches performed, at 33% and 59% respectively, compared to the global average of 25% and 46% respectively. The findings are part of a study conducted by online accommodation specialist AsiaRooms, and Lenovo, among 12,000 users 6,000 in APAC, and 6,000 in the non-APAC region in the past year. Among the 25 major international markets surveyed, Asia comes out top in online travel bookings, mobile searches and mobile bookings. Searching for travel accommodation 59%, an increase of 13% compared to the global average. Thailand respondents were the highest at 65% amongst the countries in Asia. Comparing prices of travel accommodation 50%, 10% more than the global average. One third of Asian travellers booked travel accommodation via their mobile devices, an increase of 8% on the global average. 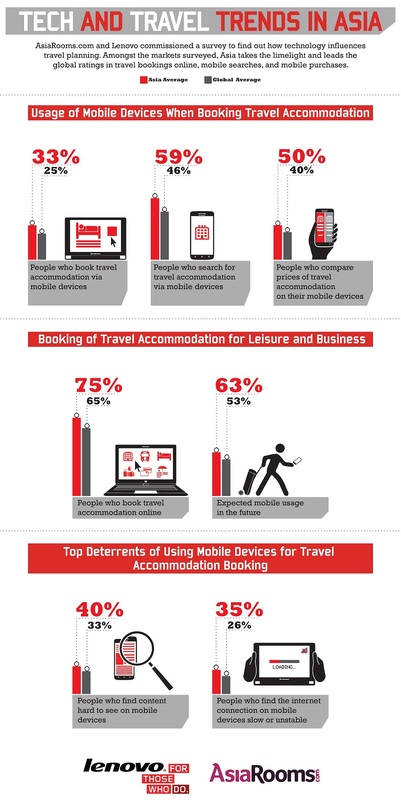 But, 63% of Asian travellers are likely to book their accommodation on mobile, compared to the global average of 53%. Although 83% of respondents own a mobile phone with internet access, 40% of respondents say it is difficult to read content via mobile. These respondents claim this as a top issue while 35% respondents report a slow/unstable mobile internet connection also as a challenge. via Asian travellers lead in mobile travel search and bookings [INFOGRAPHIC]. This entry was posted in Digital Marketing and tagged APAC, Asia, Mobile phone, Thailand by Jemma Neethling. Bookmark the permalink.